As a meditational deity Vajrasattva is visualized as an expression of mind’s pure essence. In this way negativities and obscurations are cleansed, allowing Buddha nature to manifest. As a Bodhisattva, Vajrasattva saw that all beings suffered because of their negative karma, so he made a vow to free all beings from this karma. Vajrasattva is the ultimate embodiment of all aspects of the Buddhas and represents the Diamond-like Primordial Purity of the Buddha Nature within each individual. Sattva translates as ‘spiritual hero or heroine’ and Vajra translates as ‘diamond thunderbolt’ (indestructible and pure energy). Vajrasattva embodies the 100 Peaceful and Wrathful Deities considered to be inherent in each sentient being, and also represents the Union of Compassion and Skillful Means. The lineage of Dzogchen is traced from the dharmakaya Samantabhadra to the sambhogakaya—the five buddha families and Vajrasattva, who are Samantabhadra’s own self-reflection. 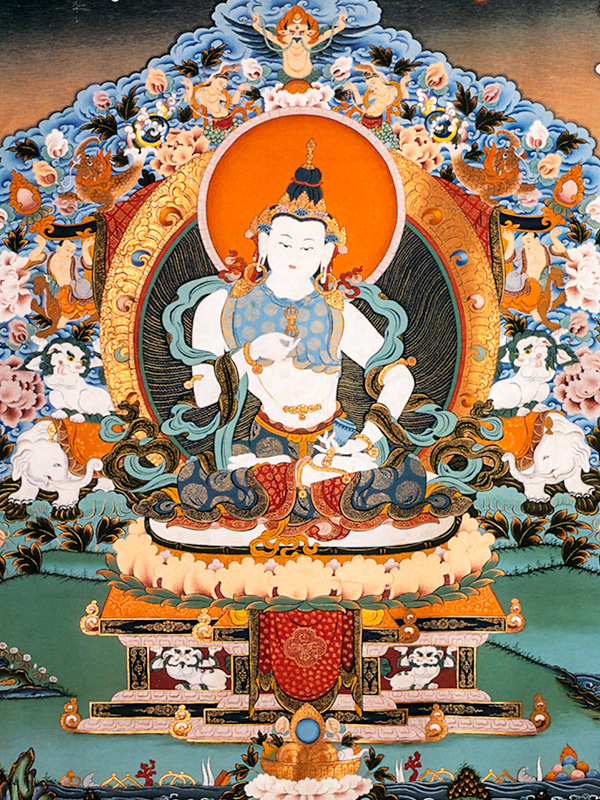 Vajrasattva is one of the four foundational preliminary practices in the Ngöndro.